I was making lasagna one night and when I went to get my ground beef, it was bad. I could have made something else but I was really in the mood for it, so I grabbed a pound of Jimmy Dean Maple Sausage and subsituted it for the Ground Beef. What a wonderful idea it was, it came out sooooo good. Hope you enjoy it. As always if you try one of my recipes, leave a comment, I would love to know how you liked it. 2. Place tomatoes and mushrooms in a pan. Heat until mushrooms are cooked. 3. Add sauce to vegetables and mix together. Combine mixture with meat. 5. Place 2 cups of sauce mixture at bottom of 9-by-13-inch dish. 6. Then place 1 layer of the uncooked noodles. 7. Add 1/3 of the cheese mixture. 8. Add 1/2 of the spinach. 10. Top with another layer of noodles and then the remaining sauce. 11. Cover with foil and bake at 375 degrees for 1 hour. 12. Take off foil and sprinkle with remaining cheese. Return to oven until brown. DINNER: Fried Chicken w/ mashed pot. Yummy!!! Loved these, tried this recipe yesterday for the first time and it was really good, the kids really enjoyed these too. I made them for lunch but you can certainly make them for breakfast or brunch, even a light dinner. Place four slices butter side down in a greased 13-in x9-in. x2-in. baking dish. 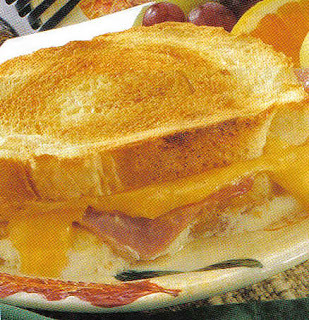 Top with American cheese, ham and Parmesan. Top with remaining bread, butter side up. In a large bowl, whisk the eggs, milk and seasonings. Pour over bread; turn each sandwich. Bake, uncovered, at 350º for 35 minutes or until golden brown. For dinner last night I tried this new Recipe from the Family Cookbook. 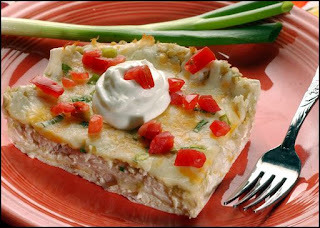 It's called Enchilada Casserole and since we love Mexican food it was a must try for me. It was wonderful, so so good, hubby kept repeating "this is SO good" in between bites and even the kids ate it all without complains and questions about what is on the plate, and is it a vegetable, can I eat it, does it taste yucky, is it hot? Preheat oven to 400º F. In large skillet cook ground beef, onions, undrained chile peppers, and garlic powder, half at a time, until beef is brown and onions are tender. Drain fat. Pour enchilada sauce into shallow dish. Dip 3 of the tortillas in sauce. Place in 13x9x2-inch baking pan. Top with one-fourth of the meat mixture, one-fourth of the cheese, and one-fourth of the soup. Repeat layers 3 more times. pour any remaining enchilada sauce over top. Tightly cover pan with foil. Bake for 20 minutes. Remove foil. Bake about 5 minutes or until heated through.